The most integral part of any Western wardrobe is a great pair of cowboy boots. At Langston's, we offer an incredible selection of Western boots from some of the top brands in the industry. We want to make sure you have plenty of options when searching for high-quality, stylish and affordable cowboy boots. No matter what type of look you're going for, you'll find it in our lineup of brand-name cowboy boots. One of the best things about cowboy boots is that they're so versatile when it comes to fashion. You can easily dress your cowboy boots up or down depending on what type of event you're attending. A simple pair of wooden sole cowboy boots could be used for working on the farm in the morning, hanging out with your family for a laid-back afternoon and then dinner or drinks with friends for a stylish night out on the town. Depending on who's wearing them and what you're doing, cowboy boots could be paired with rustic button-down Western shirts, your favorite pair of jeans or even a cute dress. The options are endless for styling your cowboy boots when you pick the right pair. At Langston's, we want to make sure everyone can get a pair that fits their needs and their personality. That's why we offer dozens of styles for the whole family, including men's, women's and children's sizes. You can also pick from authentic Western work boots, casual leather sole cowboy boots or embellished cowboy boots for a fancier look. And if you love the classic cowboy boot brand names, you're in luck. Langston's offers options from some of the most recognized and respected names in Western wear, including Ariat, Corral and Justin boots. Shop now to find your perfect fit. While just about anyone will know a cowboy boot the minute they see one, many don't know the names of the various parts of cowboy boots, let alone the terms that define those parts and the options that are available. Here we define the different elements of cowboy boots. 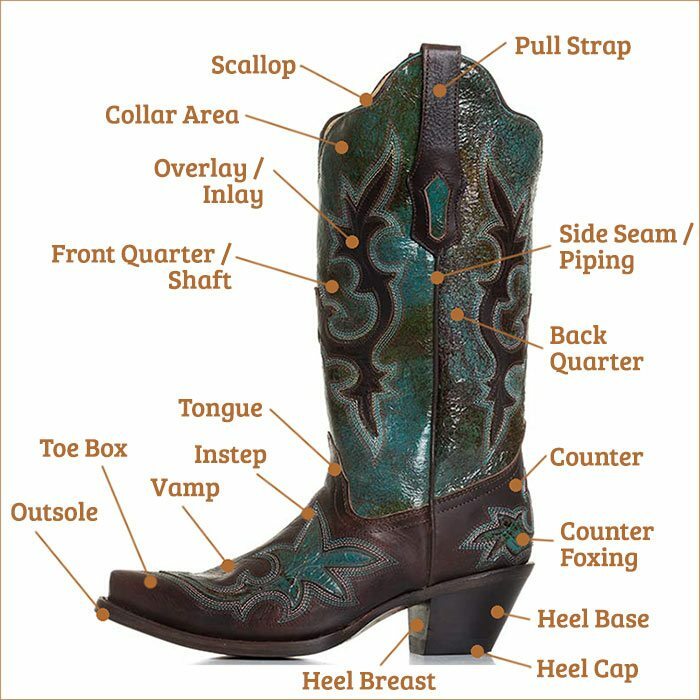 The diagram below identifies and defines the parts of a traditional western cowboy boot. Cowboy boot design and construction is extremely varied, so it’s impossible to fit every element into one diagram or discussion. Here we have focused on the most common parts of a boot that most boot buyers are concerned with. Pull Strap: Located at the top of the shaft, the pull straps help you get your cowboy boots on easier, but many boot makers add decorative elements like cut outs, inlays, or exotic leathers to add more style to the boots. Scallop: The scallop is simply the very top of the boot where the shaft ends. Scallops come in many shapes, from full scallops to roller coaster scallops. Collar: The collar, when included, is just beneath the scallop on the top part of the boot. The collar is often an overlaid piece of leather covering the top couple of inches of the boot. While the collar can add strength and durability to the top of a boot, boot makers often add decorative features like fancy stitching and cutouts. Cutout: A cutout is a design feature usually found on the shaft, but is sometimes incorporated into the vamp design. A section of the leather is cut away in a decorative shape that creates open space for fashion effect. Often contrasting or exotic leather is stitched to the inside of the cutout creating what is known as an inlay. Inlay: Inlays are when leather is inserted into a cutout (see above). Inlays often use exotic leathers and/or leathers with a different color dye to create contrast and interesting design. Shaft: The shaft is simply the part of the boot above the vamp. Most traditional cowboy boots have shafts somewhere between 11 and 14 inches, measured from the boot arch to the top of the shaft. However, you'll find cowboy boot shafts ranging from 6 inches (shorties) up to 17 inches (tall boots). Front Quarter: The front quarter of a boot is simply the front facing side of the shaft. Front Quarter: The front quarter of a boot is simply the front facing side of the shaft. Back Quarter: The back quarter is the back side of the shaft. Side Seam: The side seam is where the front and back quarters are joined. This stitching holds the shaft together and runs down the inside and outside center of the shaft. Piping is often added to the side seem for functional protection and decorative design. Piping: Piping serves both to protect the areas of a cowboy boot where pieces of leather come together and as decorative flourish. The raised piece of material, often synthetic, is often in a contrasting color to the rest of the boot to highlight the boots shape and design. Tongue: The tongue is located at the top of the vamp. While the tongue is often cut into decorative designs, it also serves to strengthen the boot and protect against wear from boot accessories like jewelry or spurs. Instep: The instep is the upper part of the vamp towards the shaft. The instep can play a big part in the comfort of a boot. This is why many people tend to find boots they like and stick with them. Different insteps can greatly change the feel of a boot. Vamp: The vamp is the part of the boot that covers the top of your foot. This is probably the most important part of a cowboy boot. As the part of the boot that will always be seen, you want to make sure that it meets your style needs. And, as the most exposed part of the boot, the vamp needs to be constructed using quality leathers and methods for durability. The way the vamp is cut and attached to the soul can also affect the comfort of a boot. Toe Box: The toe box covers the toes towards the front tip of the boots. It is a stiff piece of material placed between the boot's outer leather and its liner that helps the boot keep its shape while adding extra durability. Many of today's boots use synthetic materials like plastic or metals to construct the toe box, but some craft bookmakers still use the traditional leather. For work applications, you will want to consider steel or composite toes that meet the safety standards required. Counter: The counter is the back lower part of a boot, above the heel and below the back quarter. Boots will also have a heel counter, which is an insert that helps reinforce the heel cup to increase support. Counter Foxing: Foxing is another term for an overlay and is most often used to describe overlays on the vamp or counter. Our diagram above shows an example of counter foxing. Heel: The heel is attached to the rear part of the sole and is often a defining part of a cowboy boot. Heels can come in all kinds of heights and designs. Function should be a as much of a consideration as fashion when selecting a heel for you cowboy boots. Many find certain heels better for certain applications, like the type of riding you may do or the type of work the boots are going to be used in. Outsole: The outsole is the bottom part of the boot that is attached to the boot upper and is what most are talking about when they discuss a boot’s sole. Traditionally cowboy boot soles were made of leather, much like a dress shoe. Today, however, cowboy boot outsoles come in a variety of materials. Rubber soles, like the popular crepe sole, are common and many boots makers have been mixing in synthetic materials for their durability and comfort. The outsole is the part of the boot that will be exposed to the most wear and durable construction and materials is a key consideration. Insole (not pictured): The insole is simply the layer of material inside a boot that rests between the outsole and your foot. In the past, insoles were layers of leather, but today many boot makes have taken inspiration from athletic shoe designers and incorporated sophisticated materials and design that significantly increase comfort and reduce fatigue from impact.